Kothu Parotta or Paratha is a famous street food of Tamilnadu, South India. Kothu means chopped. Here chopped parathas are stir-fried with just a few spices adding chicken, egg or both or just adding vegetables and got their versions of names accordingly. The whole stir-fry process goes on the big tawa teh roadside stalls have. I had no idea about it till I tasted this here in Kolkata at a Chettinad Cuisine festival hosted by The Taj Gateway and it was finger-licking good. 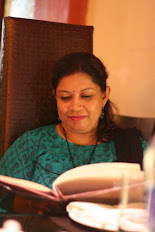 Actually I loved the whole idea of chopping the parathas and stir-fried it with cooked chicken or egg or vegetables. I remember the saying of The chef of Taj Gateway that leftover chicken curry can also be used for this paratha. 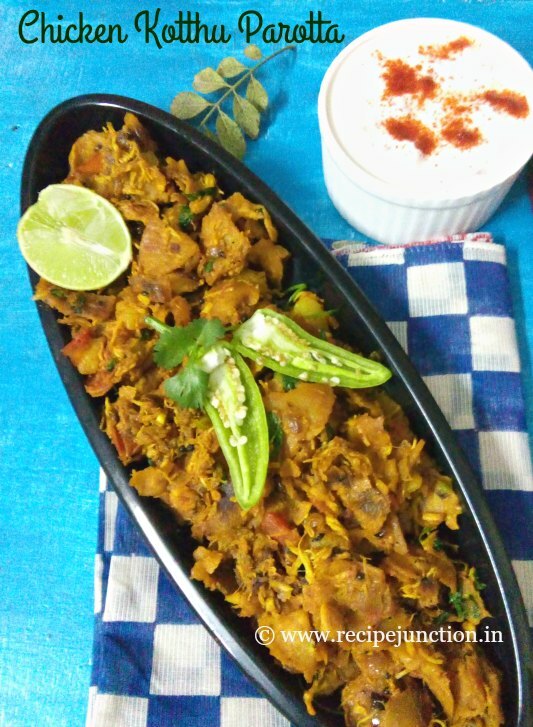 I wanted to prepare it at home, Few days back, I had a good portion of leftover chicken curry and suddenly it clicked me to prepare Kothu parotta at once. I started making Paratha immediately. Prepared a salad and a raita with it and my dinner plan was ready within an hour. Today, I am not giving the paratha recipe here. Nowadays, readymade Parathas are easily available in supermarkets. From this post you can see how parathas are made. Make the parathas and tear them into small pieces. I also seperated chicken pieces from gravy and then chopped chicken pieces into small bite size pieces. I tried to make it on tawa but couldn't manage in my small one, so transfered it into a pan. Heat 1 tblsp. oil in a pan, temper with cumin and mustard seeds, when they crackle, add curry leaves and immediately add chopped onion. Saute till they start to chnage color. Now add chopped green chilli, ginger and garlic. saute again for a minute or two. Then add chopped tomato. When tomatoes are almost soft, add chicken pieces and gravy together. Keep sauteing and mix the chicken pieces with tomatoes. Add all the spice powders (except black pepper)and salt. Add a little water and mix the spices well. When spices are mixed well, add chopped parathas little at a time and mixed with the chicken and onion-tomato mixture. Add all the chopped parathas. Now add the tomato ketchup and black pepper. Check the seasoning and add salt if needed. Tip : Once you add parathas, after process has to be fast, otherwise the parathas will get hard. Lastly, add fresh coriander leaves and remove from heat. 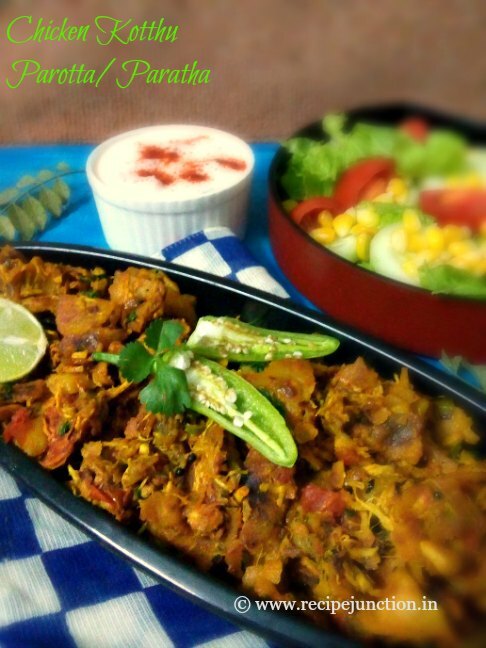 As you see, it is a quite heavy meal itself, serve it with a bowl of Raita and salad.